The Kastamonu Governor's Office, the International Organization of Turkic Culture (TÜRKSOY) and Anadolu Mektebi (a special educational institution focusing on Turkish culture and heritage) organized a "Cengiz Aytmatov, the Sage of the Moors, on His 90th Birthday" program in Kastamonu. The program offered students to read from Aytmatov's works and the life of the famous author of the Turkic world was explained later on. Askar Aytmatov, Cengiz Aytmatov's son, also attended the event and noted that his father was liked very much in Turkey. Explaining that his father was a common value of the Turkic world, Aytmatov said he witnesses how Turks embrace his works. "The way Turks embrace my father pleases me. 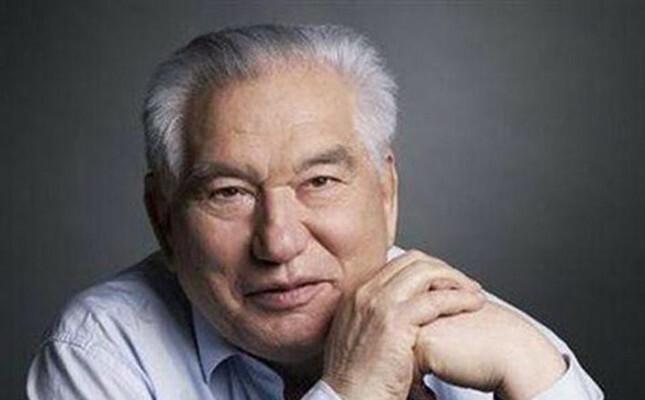 Cengiz Aytmatov is a common value of Turkic culture, helping the Turkic world become closer," added Aytmatov. Explaining how Turks arrived in Anatolia with a humorous tone, Aytmatov noted that their ambassador explained how the Turks separated from the Kyrgyz but never told them the reason. "Kyrgyz back then were divided into two. One side loved horse meat while the other did not eat it. Those who loved horse meat finished all the horses. So when it was time to head West, those who ate horses had to leave Central Asia," said Aytmatov. Kastamonu Mayor Yaşar Karadeniz said it was a day full of various beauties and he further noted that Aytmatov was an author who embraced his own land, fed from his homeland and introduced his works to the world, which makes the author special. "He was a very talented author as he created his works emerging from Kyrgyz culture in a way that they addressed the whole world. One of his books was turned into a movie in Turkey and was very popular," said Karadeniz. He also addressed Anadolu Mektebi and thanked them for introducing the habit of reading, for helping them to interpret what they read and creating new ideas and becoming example citizens for their nations when they grow up and lead others. The chairman of the Board of Directors of Anadolu Mektebi, professor Sami Güçlü said children on Anatolian soil loved Aytmatov's work with a passion. "Students from 16 cities will tell the story of Aytmatov, whom they love and they read. I believe many of them will become artists, men of letters and academics when they grow up," said Güçlü. He also noted that these children will be building the future of our nation. Anadolu Mektebi was established seven years ago and at the event there were teachers and students from 16 cities. "We did not dream Anadolu Mektebi would cover this much ground, we just set on the road. We started preparations for the 90th birthday of Aytmatov in September 2017. It was a long process but worth the effort," added Güçlü. Mayor Tahsin Baba, TÜRKSOY's Assistant General Secretary Fırta Purtaş, academics, office managers and students from Turkey and abroad attended the event.